Today’s recipe is a real treat — and that’s no accident! Lauren Lobley, former pastry chef and head baker to Food Network star Duff Goldman, gave up her pastries for healthy food almost ten years ago, and after much trial and error, she’s come up with the way of eating that works best for her — vegetarian Paleo — which she talks about in her new cookbook, The Accidental Paleo . 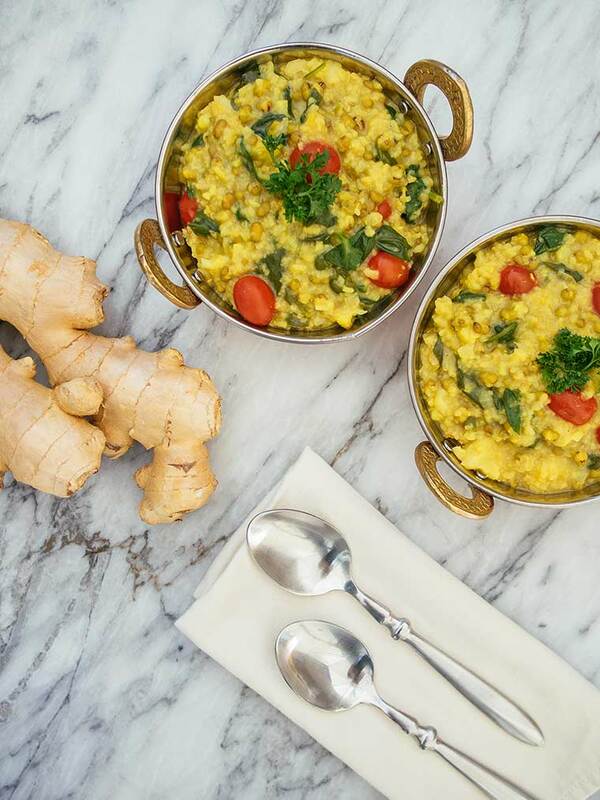 She takes a carnivore’s approach to plant-based eating, making sure every recipe has a variety of textures, layers of flavor, colors and nutrition so everyone — vegetarian, Paleo, you name it — will find something delicious, like the recipe below for Kitchari! In addition to sharing one of the book’s recipes, Lauren also took the time to answer a few of our questions about the recipe, her book, and her approach to healthy living. Fit Bottomed Eats: This recipe was recommended to you by a naturopath. Could you explain what makes Kitchari so beneficial for health — and yours in particular? Lauren Lobley: The basic reason why Kitchari is recommended — specifically for digestive health issues — is because it is so easy to digest. The combination of mung beans and rice actually is very easy to digest, which takes away from the amount of energy your digestive system needs to use up in order to assimilate the food. Another great thing about Kitchari is that it provides a nice amount of protein. This dish is often used in cleanses (though I use it as a meal for my family, which also works), and since cleanses often limit the amount of food one can eat, the added bonus of it being higher in protein helps people stay fuller and satisfied longer. Finally, because of the warmth and the spices, Kitchari makes for a nice, warm, grounding food — particularly in the winter months, when our bodies naturally crave warming, more filling foods. FBE: I think a lot of people are open to eating well and cutting out the foods that they know aren’t good for them, but between the prep for new dishes and cutting out foods that they’re used to eating, it can be intimidating. What advice would you offer someone who’s struggling to make real changes in their kitchen? LL: Baby steps, baby steps, baby steps. When I discovered food as medicine ten years ago, I was eating processed meats, processed dairy, and a ton of refined sugar. It was all I ever wanted to eat. I honestly couldn’t eat a vegetable unless it was smothered in some not-so-good-for-you bottled sauce from the store. Cut to ten years later, and though my sweet tooth is still around, I don’t eat any processed meats or dairy (or any in general), and certainly no refined sugar. I’m by no means perfect, but the point is that I had to make small changes over time in order to get to where I am (I once had a yoga teacher remind me that micro movements will bring massive changes over time. This has been true for my food journey). Finally, give yourself a break. If you “cave” and have too many slices of cake, all is not lost for the day. Just make a better choice at the next meal time. My friend, Tony Horton (Editor’s note: Hey, we know him too! ), always like to say that every moment is an opportunity to make a better choice. That is true everywhere in life, and in the kitchen too. Spend some time in the book store researching healthy cookbooks (like mine!) you like, buy one, and dedicate some time to testing out recipes. Start looking for healthier alternatives to the things you like to eat. For example, try swapping out your milk chocolate for dark chocolate (I worked my way up to 85 percent dark chocolate, but don’t start there), or your regular burger for a healthier turkey burger or even veggie burger. Basically, don’t stray too far away from what is comfortable for you. You’ll get there eventually. No need to rush it. FBE: People tend to put Paleo in one box and vegetarian in another one … far, far away, on a different shelf entirely. Can you share a few of the things these two ways of eating are similar? LL: Vegetarians and Paleo people have one very big thing in common: they both make vegetables the staple part of their diets! There is a common misconception among us that if you’re Paleo, you eat nothing but meat and a few other things. But it’s actually the opposite: if you’re Paleo, you eat meat, but not a lot of it. And — as I have shown in my book — you don’t have to eat meat in order to be Paleo. Vegetarians also eat eggs, as do Paleo people. But if you don’t eat eggs and still want to be Paleo, all is not lost! In the more progressive arm of Paleo, you can have a limited amount of legumes and super grains, as long as the lectins have been cooked out of them (and there is some scientific evidence that we actually did eat these things before the birth of agriculture). Additionally, nuts, seeds and fruits are also a staple of the vegetarian and Paleo diet, and another great way to get the protein you won’t get from meat (also fun fact: vegetables have protein in them too!). Heat olive oil in a large soup pot over medium heat. Add the onions and sauté for about 5 minutes, until translucent. Add ginger and sauté for a few more minutes, until it starts to brown. Add the cumin and stir, ensuring the ginger is coated. Add the cauliflower and cook until browned. This should take about 5 to 8 minutes. You can turn the heat up to get the browning process going. Just be sure to watch it and stir every few minutes. Add the rice and mung beans. Stir and sauté for about 3 to 5 minutes, just enough to bring out the nuttiness. Add the rest of the spices and about 8 cups of (2 liters) water. Bring the mixture to a boil (lid on). As the mixture starts to reduce and the rice and mung beans absorb the liquid, test the doneness of the beans by tasting them. If they are still hard after most of the liquid has been absorbed, add another cup of water and continue to cook at medium-high heat without a cover. Taste the beans again, and if necessary, add another cup of water and keep cooking. Continue in this fashion until the beans are soft and most of the liquid is absorbed. When almost all of the water is absorbed, add the spinach and tomatoes, and stir. Keep tossing/stirring until the spinach is wilted down. Season with Himalayan salt to taste.